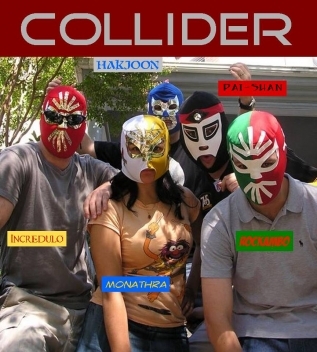 Collider is a five-piece rock band from Washington, DC. Its members have merged their love of indie, punk, metal and classic rock to generate a sound that can only be called Swagger Rock. Collider's fun and flippant musical approach plays with what is most fun about rock and completely ignores ego or self-importance. With the rock of AC/DC, the strut of Thin Lizzy, and the comical hooks of The Donnas, Collider reminds its audiences that rock music is supposed to be fun. Collider's album, "Six Story Walkup", was released this past summer. On Tap Magazine called Collider ""Solid, female-fronted, in-your-face rock.... [with] driving guitars and a steady backbeat pave the way for lead singer Mona Sahaf to soar."